Does one always want to know how the magic trick works? Does getting to know the process of something we love help us to love it more? Or does it become so familiar it loses its power? For us curiosity-seekers, we might find it can’t hurt to at least get a taste of what McCarthy has previously held very tight to his chest. 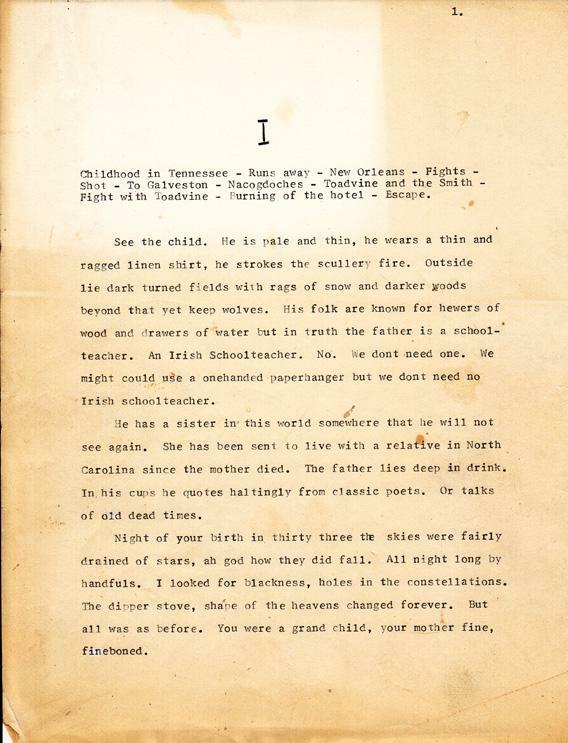 He’s left behind a veritable treasure-trove of original drafts–98 boxes of notes in all–archived at Texas State University-San Marco’s Wittliff Collections. Bought for $2 million in 2008 as a joint venture between the university and Bill Wittliff (screenwriter of Lonesome Dove), the collection includes unpublished material such as a screenplay, Whales and Men, and drafts of an upcoming novel, The Passenger (not available for reading until after publication). One of the most revealing parts of this collection are the numerous drafts of Blood Meridian: Or the Evening Redness in the West. Judge Holden, the unforgettable antagonist that really gives the novel its resounding quality, didn’t even enter the novel for several drafts, sometime in the late 70s. When he did, we also learn from the archives, he came from the influence of a historical figure from Samuel Chamberlain’s My Confession: Recollections of a Rogue. 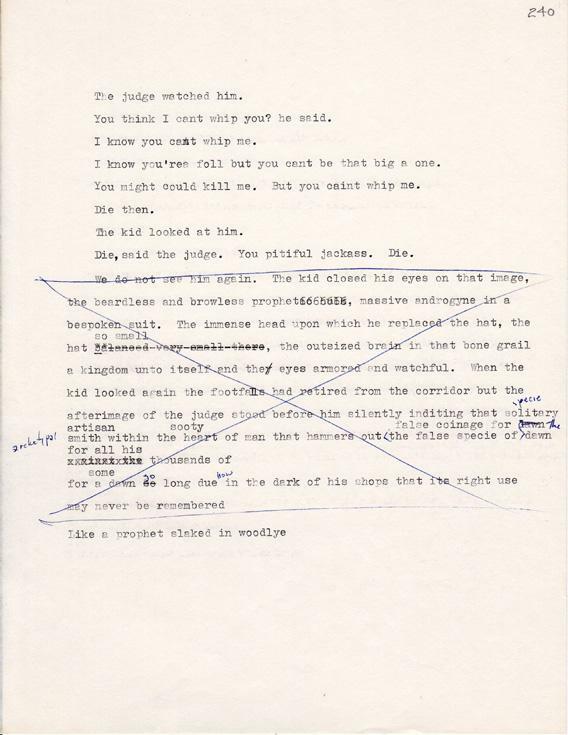 McCarthy is known for being a slow writer–and one can begin to see why just from a couple of these original drafts, as well as learning about how he will cut characters completely out of a novel or at least pare their backgrounds to the bone–we can see why. He is also capable of writing sections such as the legions of horribles, something many writers could spend a lifetime trying to execute, in one fell swoop. There are loads of books out now on “reading Cormac McCarthy,” but if you want access to a book that became legendary in its own right, falling out of publication and still being so highly sought that it sold for hundreds of dollars until it was brought back to publication courtesy of the Wittliff Collections, John Sepich’s Notes on Blood Meridian: Revised and Expanded Edition shares information about the primary sources and notes that McCarthy used. If used as a guidebook on the necessity of intensive field research to create verisimilitude, I highly recommend. If trying to pare to the core of inspiration, you might find the search hollow. You might never read McCarthy with the same pleasure, and you might find you’ve lost your own way by following so closely another.